Landschaft German Shepherds is a working line German Shepherd breeder. Located in Illinois, just outside Chicago, Landschaft German Shepherds has been in the “dog world” for over two decades. And has built a reputation of professional excellence. Recipient of United Schutzhund Club of America’s Gold Breeder’s Award. Recognized AKC Breeder of Merit. Landschaft working line German Shepherds is not a commercial kennel. This is our home in a quiet country setting. We are breeders with strong character, ethics, and integrity. And are deeply committed to the working line German Shepherd Dog. Whether bred or imported by us. Landschaft dogs are high quality working line German Shepherds. That have exceptional temperament. And are a joy to train. They are trustworthy. Versatile, affectionate, and stable. You can take a Landschaft dog into any environment or situation. And be comfortable and confident in how they will respond to their surroundings. Landschaft German Shepherd Dogss are highly sought after for competition dog sports. (Schutzhund, AKC obedience,Working Dog Sport, Agility, Rally, Flyball) service work (Police K9, Search and Rescue). And superior family companions. Where other breeders jump on the bandwagon after the fact. 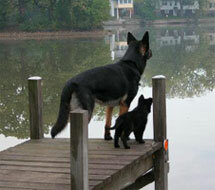 Landschaft German Shepherds has the desire and ability to be on the cutting edge of the GSD world. We have insight and connections to the German Shepherd Dog worldwide. Much of our success is due to the fact that we talk to you in depth about your wants. And desires in a German Shepherd. No matter what level of ownership or competition you are at, we can meet your needs and are available to you as a resource throughout the life of your dog.